Over the next three days T3 will be live at the Belgian Grand Prix thanks to Shell and Ferrarri. You can follow our exploits here, and get a chance to see what it's like behind the scenes of one of the most exciting races in the Formula One season. 16.30: After a Eurostar journey opposite two veryloud children, and a very slow taxi ride to our hotel, we've finally arrived. Wi-Fi is surprisingly fast, always an important point. On tonight's agenda, we'll be having dinner with Ferrari reserve driver Esteban Gutierrez. We'll let you know if he has anything interesting to say. 22.50: We had dinner at the Hostellerie le Roanney, a restaurant and hotel frequented by the likes of Bernie Ecclestone and F1 drivers (it's like an oasis of rich peoplein the Belgian forest). The Roanney is a bizarrelocation, it's kind of like going around your nan's house, but if your nan's front living room is filled with F1 drivers, engineers and millionaires. Esteban Gutierrez is a very nice young gentleman, with a real passion to continue moving up in Formula One.If you wondered what car he drives, it's an Alfa Romeo Guiletta (although he doesn't actually do that much driving). He had to leave the restaurant at 9 PM on the dot so he was feeling rested for tomorrow. We wish we did the same. Apparently Lewis Hamilton arrived by helicopter while we were eating. 9.30: We arrive the circuit and decamp, everywhere is surprisingly busy, considering it's only first practice on a Friday morning. 9.45: We make our way to the Shell Hospitality Suite, located just inside Eau Rouge, just at the foot of the hill. Inside, thehall is decked outin 1950's paraphernalia. We also have a challenging area, withdriving simulators, Samsung Gear VR headsets, and BATAK, the machine Formula One drivers use to test theirreactions and peripheral vision. 11.00: It's time for a quick tour around the Paddock. He ventured out from hospitality on golf buggies and given a special VIP pass. Spa is a slightly irregular track in that the paddock is split over two levels. The lower level is where the drivers can relax and get briefed (they even have they own individual bedrooms). 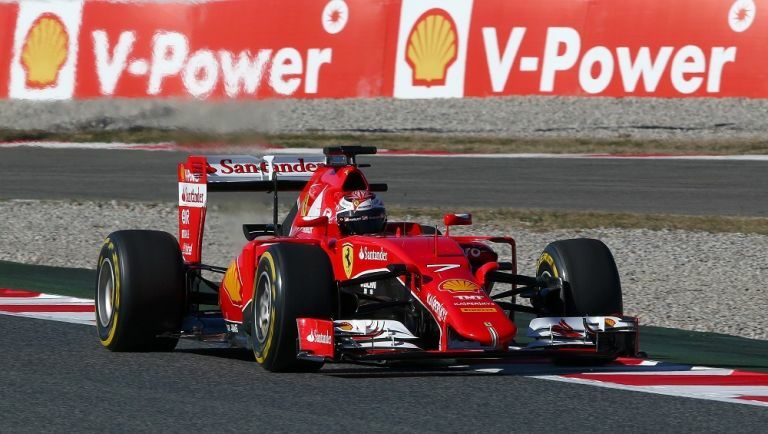 Ferrari brings 120 people to every Grand Prix, around 60 technical staff, and the rest accountants, PRs and the like. Everything is transported around in 16 trucks and motorhomes, so the logistical challenge is immense. We also had a look inside Shell'strack laboratory where they constantly check the fuel and oil for contaminants. Over a race weekend, Shell takes 40 samples of fuel and 90 samples of oil. Shell constantly check the fuel for contamination because if the sample taken by the FIA at the end of the race is different to the sample taken at the beginning of the race, then the car could get disqualified. Oil is tested for 15 key metals, the amount of metal found in the oil shows how much the engine has degraded (and how close it is to giving up). 12.55: Free Practise 2 is about to start. Niko Rosberg was fastest in FP1, with Hamilton a close second. "It's always a compromise, if they leave it up to all the engineers then the driver has less of an input, and I think the spectators want a bit of everything in Formula One. The spectators favour teams, and some drivers, but we have to make sure we don't go either way. Because if we go, 'It's a driver's championship', the manufacturers will pull out, if it's a manufacturer's there are spectators that will lose interest in it. So we have to keep balancing it all the time. I think there's quite a good balance." 18.30: Practise is over, and we're back at the hotel. Nico Rosberg suffered a dramatic tyre failure, with the rubber exploding when he was travelling at 180 mph. Despite the problems, Rosberg also was fastest in the second practice with a lap time of 1.49.385. Apparently Rosberg's wife is due to give birth any time soon, and he has a private plane standing by so he can be present for the birth. We bet Hamilton can't wait for that call. 8.00: Apple Watch has run out of battery, no time to charge it. Resorted to the Pebble Time instead, maybe I'll download a Ferrari watch face. 8.30: Overheard on the coach, 'We're on three different time schedules here, the Germans are five minutes early, the English are five minutes late, and the Italians are twenty minutes late." 11.00: The final practise session is about to get underway. Will Rosberg remain on top? We've just spoken to James Allen, BBC Five Live presenter, who thinks Hamilton is the best driver in F1 at the minute, Rosberg needs to watch his seat from MaxVerstappen, and this could be Maldonado's last season (unless someone really wants his money). Oh, and don't hold you breath for McLaren-Honda to start winning podiums ANY time soon. 12.00: We watched the end of the final practice from half way down the Kemmel Straight, where teh cars have been reaching speeds of around 340 kph. Hamilton was fastest (go Brits!) with a lap time of 1.48.984. Rosberg was second, and Vettel third. Alsono didn't set a time due to an exhaust failure. The Porsche Mobil 1 Supercup cars are currently going around the track. 14.30: Qualifying is over with Hamilton taking position (it was a bit awkward cheering for Mercedes surrounded by a load of people in Ferrari/Shell shirts, but there you go). Lewis recorded a time of 1.47.197, Rosberg came in second, and Bottas in Third. Sebastian Vetel was unlucky in 9th (moved up to 8th), but Kimi Raikkonen, Fernando Alonso and Jenson Button were even more unlucky, with 14th, 18th and 17th respectively (final results may change). 15.00: Sebastian Vettel dropped by the Shell Suite to say hello, as you can see, the man is very popular. When asked about his future at Ferrari, Seb said, "Well I've just started at Ferrari so hopefully there's a lot to come. We've had a great first half of the season, great start for me to join the team and obviously we'll try and make progress from here." A very diplomatic response. 10.00: Slightly more relaxed morning today, missed the coach to the circuit, but got taken in a much more comfortable car. Waiting for Kimi Raikkonento come on stage at the Shell Suite, hoping he says something contriversial. 10.40: The vintage cars for the driver's parade are all parked up. Lewis Hamilion has an £800,000 Mercedes 300 SL convertible, Maldanardo (infamous for crashing) has a £31,000 Lotus Elan with a roll cage fitted. 14.00: The race got off to an excellent start, with Perez getting a blinding start to take first place (for a short while, before Hamilton took the lead again). We watched the entire race from the grandstand inside Eau Rouge. It was a great location as there was a large television placed opposite, so when there's nothing going past, you can keep updated with the race. 10.00:If you were wondering where the final update is, it's come a little bit late. As you've probably heard by now Lewis Hamilton won the Belgian Grand Prix and extended his lead over team-mate Nico Rosberg in the leaderboard. There were big sighs from our Grandstand as Sebastian Vettel, who looked set to get 3rd position, suffered a tyre blowout on the final lap of the race. A german man in our group who had been carrying a massive Ferrari Flag all weekend (and that's true dedication and commitment) looked close to tears. The cars parked up at the podium, and we legged it out of the circuit to the coach - it's important to beat the traffic, you see. This is where the problems started. Upon starting the engine and setting off an incessant beeping started, every second, and very high-pitched (so it's couldn't be blocked out by headphones). The Belgian police guide you through the roads, away from the circuit, to avoid congestion. For us, this involved going an hour in the wrong direction. We didn't worry at first, we still had plenty of time to get to the train station. Then we hit the traffic jam, and watched the ETA slowly tick past the train departure time. All this, while the beeping continued. Then the most bizarre thing happened, an ear piercing monotone ringtone, that sounded like something from the Adam's Family began playing over the bus speakers. It played through about 4 times, and no one had any idea what it was at first. The second time it played the coach attendant lunged over the driver and picked up coach phone. All this while the incessant beeping continued. The traffic cleared up, but we arrived at Brussel's Midi train station twenty minutes late (that was four hours in the coach). So we'd be spending the night in Brussels. Amazingly we got the final nine rooms in the hotel located at the station, and made it onto the first train home in the morning, and went straight to work.